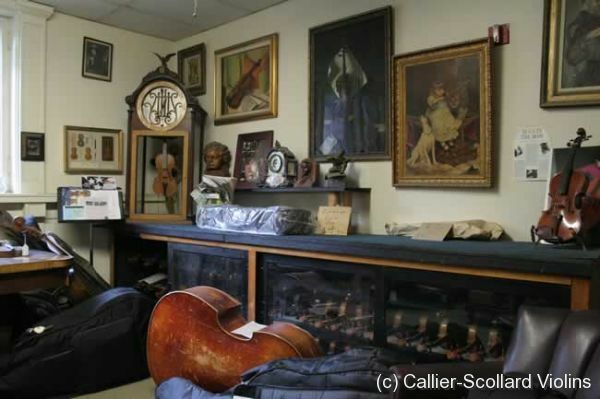 Welcome to the Callier-Scollard Violin Shop. I rent violin, viola and cellos. Small size violin rentals are $12 per month including tax and full size violins are $14 per month including tax. Larger size violas rent $ 18 per month including tax and cellos rent for $35 per month including tax. I have all sizes and they are adjusted by fitting bridges, adjusting the pegs, nut and sound post. Please call ahead if you know what size instrument your child needs so that I can make sure I have one set up. We are located in historic Old Town Pasadena at the corner of Fair Oaks and Green in the Green Hotel. The entrance to the building is in the center of the block, it's the door with the stairs. Press 142 and the "Call Button" and I can buzz you in. No appointment is necessary during normal business hours. If you are picking up a violin or bow, please call ahead to make sure it''s ready. Violin Bow rehairing is still $22 if you leave it for one week and violin repairs are still reasonably priced. Here are a few shots of the front room. Of all the violin shops in Pasadena we are Pasadena's oldest violin shop. Paul was originally on Fair Oaks then he had a shop located at his home on Los Robles. The Green Hotel has been the current location for nearly 40 years. The original Hollywood shop was established in 1928 and was located at 5906 W. Sunset near Bronson. 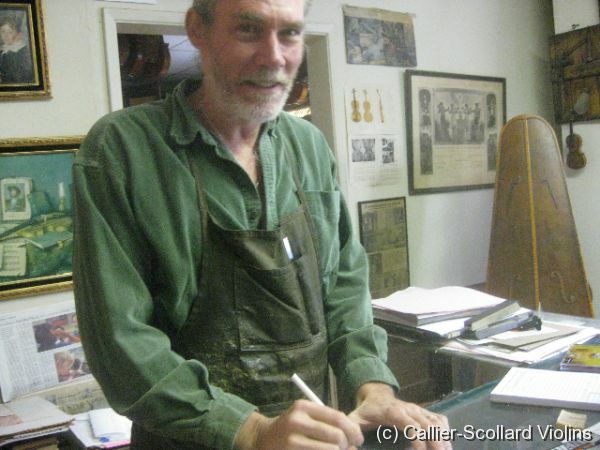 When Craig Scollard took over the Hollywood shop, it was moved to 1438 N. Wilcox near Sunset. Violin repair customers frequent the Pasadena shop from the following local communities. Pasadena, South Pasadena, Glendale, Hollywood, Los Angeles, North Hollywood, San Fernando Valley, San Gabriel Valley, Studio City. Hello there, I love to write short stories about all the people, history and buildings in Los Angeles. I was passing the other day and peeked through the window in amazement. I thought to myself, what art, what skill. People need to know about this and I should write a story about your place. I am reaching out to see if you are interested. I post all my stories on Instagram under the name: angelenoheart. Thank you for taking the time in reading this message. I always bring my violins to Craig. His knowledge and workmanship are beyond amazing. 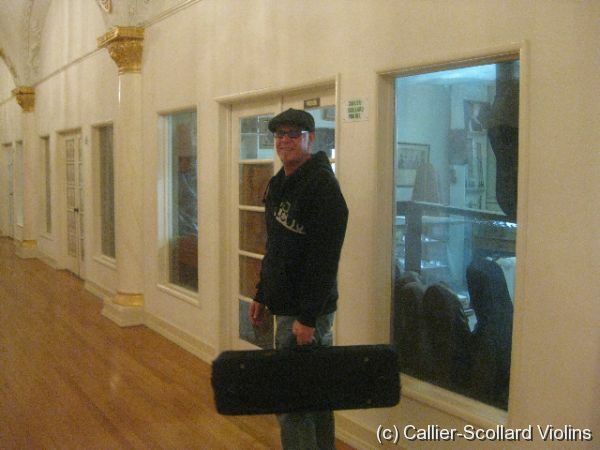 Over the years, he's worked on my 1924 Ansaldo Poggi, my 1925 Enrico Polleti and recently mid 1800's unknown violin. (This violin was saved from a fire.) Also his prices are extremely fair. BEST LUTHIER. Thanks Craig for your expertise and honesty. Fantastic repair. I dropped my pernambucco bass bow and it split in two. I asked Craig if he could fix it. The answer was yes. I cant even tell it was ever broken. Absolutely fabulous job. I would definitely recommend him and his work. Nice guy and such reasonable prices. He rehaired my other bow and now it plays so much better.. Smoother and sweeter. He rocks. Craig upholds the acme of quality. His work greatly improved the sound and feel of our modest violin. What a joy to meet a craftsman and artist with integrity and talent. In addition to repairs, he did a wonderful job rehairing the bow. We are very pleased. Would you have any information on it? Craig cares about maintaining a superior standard of quality and integrity in his business. He is the most extraordinary person I know. 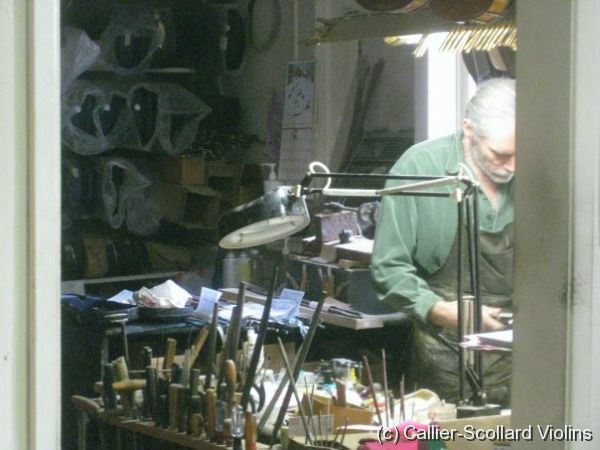 Craig has been the only person I have gone to for violin repairs and supplies for the last 35 years. Craig is honest, caring, and considerate. He is saint in the human world and in the business world. You can't say that about a whole lot of people -- artists or businesses. May God always bless him and protect him in all things everywhere, forever. As a musician who has worked in several violin shops as well as visited dozens both in the US and abroad, I give the work of Craig Scollard my highest recommendation. His repair work is expert and painstakingly good, and his fees are very reasonable. In a profession plagued by conflicts of interest, greed and chicanery, Craig's honesty and humble expertise are a rare find. You will not find a more reasonably priced, down to earth violin shop where the repairs are done by an experienced luthier. I am a cellist who has been around for years and have seen alot of shops but this is the one I always recommend to students and colleagues. Each time I take my bow to be rehaired, I know the job will be done in the best possible way. The workmanship is top-notch, as well as the hair used at this shop. Congratulations to you on years of fine service to the community of musicians throughout the area. Going into your shop was an fantastic experience in itself. Between seeing all those wonderful instruments and while I was waiting watching you with such A notable clientele. Seeing in their eyes, the respect they have for you and your craft. It went from a casual visit to an exciting one. The location is fabulous too. I have never seen such a perfectionist, a person who takes so much pride with even the trivial repairs.